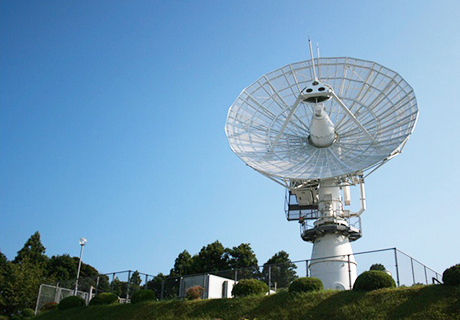 The Katsuura Tracking and Communications Station was established in Katsuura, Chiba, in February, 1968 as Katsuura radiowave tracking base of the Science and Technology Agency (STA) Space Development Headquarter, and was affiliated with the National Space Development Agency in October, 1969. 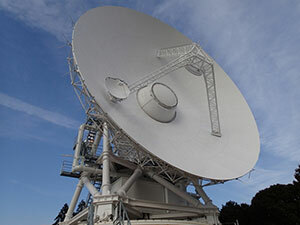 The main role of this Station is to track and control satellites. After receiving telemetry from satellites, it checks their location, altitude, and instrument functions. It also sends commands to satellites as required, in order to maintain and control them. Apart from the 20-meter, 13-meter, 11-meters and 10-meter diameter parabolic antennas, we have a tracking and control facility, a power supply facility, and the Nonozuka collimation tower (on Nonozuka Mountain). At the Katsuura Tracking and Communications Station, there is a tracking and control facility, power supply facility, and the Nonozuka collimation tower (on Nonozuka Mountain) in addition to the two parabolic antennas that are 13 meters and 10 meters in diameter, respectively. For visitors, we have a space development exhibit hall and panel corner. For large-sized vehicles, please contact us in advance as available space is limited due to car size. 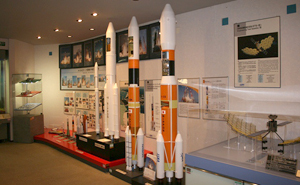 Miniature models of the H-IIB, H-IIA, H-II, J-I, Kibo and satellites, and images from weather satellites are on display. There is also a tracking and control simulation. 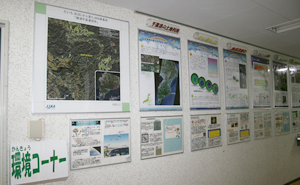 Panel displays show images of the Earth from space and have information on global warming, ozone-layer damage, and global environmental problems.